Learn how to do a peach ledge dodge in Melee. This is where peach lets go of the edge and then air dodges to the stage. Hi guys, Ryan here from a melee.co. In this episode I want to show you how to air dodge from the ledge as Peach or as I like to call it a ledge dodge. You can see on the screen right now a gift of the Peach ledge dodge. Basically, she grabs the ledge, you let go of the ledge and then you air dodge up and diagonally towards the ledge. I’m going to show you how to do these inputs. I can’t do it frame perfectly. I think if you do a frame perfectly there are about five frames of vulnerability there. So if we go back to this page here we can see air dodge – it has five frames of vulnerability before first IASA frame. This is one of the easier things to do as Peach to get back to the ledge apart from obviously standing up, jumping, just pulling off the ledge, that sort of stuff. I’m going to go ahead and jump onto my CIT and show you guys the inputs to do this. You can practice this on any level you want but here I am on FT and we can see player one – that’s me which is Peach. What we’re going to do is to hang on to the ledge and we going to pull off the ledge and go diagonally up straight back on to the ledge. You can see that I actually messed that one up but that is the basic premise of it. As I said I can’t do a frame perfect but that is how you get on to the ledge. There are a few different elements of this which I’ll go through with you and I’ll show you how to do it on my controller. The first one is actually getting off the ledge. There are a couple of different ways you can get off the ledge. I’ll just switch to a larger screen of my face and we are going to have a look at the controller here. So let’s get Peach on to the ledge. There are different ways to get off the ledge. Firstly we can press back on the controller. If we press back on the controller using the control pad then you can see she drops down but she also kind of drift. You can also press down on the pad and she’ll fall down and she’ll stay close to the ledge but generally you’re going to fast forward and that makes it hard. You can do it in these ways – you can use back on the D pad and then go up but it’s just so much harder to do. The third option which I only just found out thanks to PP University (thank you PPU) is you can actually exit using the C stick. If I press back using the C stick you’ll see that Peach falls but she doesn’t fast forward and she doesn’t fall away from the edge. So again using the C stick to fall we can see that she just falls slowly and stays close to the edge. I’ll show you the difference between that. This is using the C stick so she just falls straight down. And this is using the D Pad. I am not the D pad so I’m the Control Pad. So you can see when I use the control pad she goes slightly away from the edge, however, with the C stick she just goes straight down. That makes it a lot easier as well if you’re going back and then you’ve got to go in the opposite direction. If you’re going away and you are going to get all the way up over to the other side that can take a fair bit of time. It’s going to be a bam bam and you got to do that in one frame if you want to be frame perfect. It’s a lot easier to go with left of the C stick and so that’s what we’re going to do. This does take some practice to do but basically that’s how you do it. So back with the C Stick and then diagonally up and air dodge with the control pad and whichever trigger you use to Air Dodge. It doesn’t really matter which trigger you use either row. I use the left trigger but that’s because I’m still practicing trying to Air Dodge with the right trigger. I can do both but I’m not as good with the right trigger. The other thing I want to let you know is that when you’re practicing this and when you’re starting out there is a slightly easier way to do it that is more guarantee and that is to actually Air Dodge up and then go towards the stage. 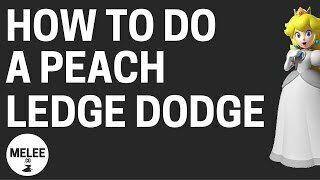 So if I air dodge up so we again pull away with the C stick and then air Dodge up – that was a bit late, but this gives you some more grace and it gives you an easy opportunity to practice it. It also means if you miss going towards the ledge (which is actually hard for me now) then she’s going to re-grab. I can air dodge up and then if I miss she will re-grab. So if you’re practicing it you can start pulling off, air dodge up and then move towards the stage and then as you get better you can get it down and get it more diagonal. I’m still working on it. That is the basics of how you do a Peach Ledge Dodge or a Peach Air Dodge to the Ledge. I hope that this was helpful to all of those Peach players out there. This will just improve your ledge options because Peach’s Ledge options aren’t very good. You can check out some more technical Ledge options – just Google “Peach ledge options” and it will come up or you can see all my other videos by going to www.melee.co/youtube and you’ll see all my videos from YouTube. Thanks for watching guys. Until next time, going places on Melee.